Published Tuesday, April 10, 2012, OK personal/derivative use; link www.lovethatimage.com. If you’ve visited Seattle, you’ve probably visited Pike Place Market, home of the original Starbucks and flying fish vendors and all that. But you might not know that the north section with the fresh flower vendors is filled only with flower vendors who grow all their own flowers. 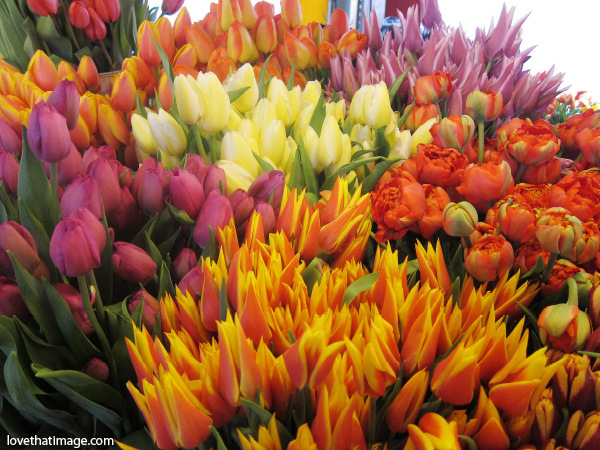 Nothing is shipped in from Chile, just all local blooms from the Seattle area fields and farms. You’ll see flower combos like you have never seen anywhere else, and the masses of tulips on display right now are just something else. I love tulip season! Take a look at Mellow Yellow Monday, Today’s Flowers, Weekend Flowers, Floral Friday, SOOC Sunday (straight out of the camera), Scenic Sunday, Ruby Tuesday 2 and Pink Saturday for more photo fun. If you’d like to receive email notices for each blog post here, the RSS orange icon at top right makes it easy. Let me know via comments if you experience any difficulty with that. Thanks for visiting! wow, all the colors are fantastic! One of my favorite markets. Everything there looks so good. The tulips are so beautiful. I love the mixture of colors. I would have to stay and enjoy for a long time…..so beautiful! !